Since launching more than 60 years ago, Triad Magnetics has become a global leader in the manufacture of magnetic components. Today, we employ a team of highly skilled engineers, maintain fully ISO certified facilities, and operate fully modernized testing laboratories — all in the name of creating inductors, transformers, and power supplies of the highest possible quality. Our unwavering dedication to strict quality standards is particularly important for the medical and medical equipment industries. Over the past six decades, Triad Magnetics has established expertise in the design and manufacture of transformers for a wide range of industries — and an even wider range of applications. This expert knowledge is especially important in the medical equipment industry. Due to the very nature of medical equipment — people’s lives depend on the successful functionality of such components — this industry has a complex, multifaceted, and ever-changing regulatory landscape. Many magnetics manufacturers lack the knowledge or expertise required to ensure that their products meet all regulations, so they cannot ensure a reliable, high quality final product. 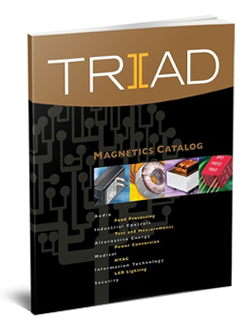 Triad Magnetics can make the quality guarantee that other manufacturers simply cannot match. We manufacture magnetics components that consistently meet not only client performance specifications, but also the strictest of medical regulatory standards. Transformers for medical equipment, isolation transformers for medical applications, and other medical grade transformers are all designed explicitly to meet the toughest regulations. With constant technological advances and increasing pressure to innovate, the medical industry is heavily reliant on the latest electronic devices. Medical professionals employ a range of equipment, from portable medicine drip controllers and oxygen pumps to MRI and CAT scan machines, each of which require power supplies and transformers. Medical grade isolation power transformers were designed for use in controlled spaces. Delicate health monitoring equipment and medical tools can be affected by the stray electromagnetic fields created by complex electronics. Isolation transformers, which act as a buffer between the power source and connected equipment, use Class F insulation systems and other innovations to dampen those fields. Our toroidal medical power transformers work similarly to our isolation transformers — we design and build them specifically to ensure low stray field and low leakage current levels. In an industry where regulations are strict, and quality and reliability are important above all else, it is important that you trust your magnetics supplier. Thanks to our extremely knowledgeable engineering staff, state-of-the-art facilities, and our personal dedication to maintaining the highest quality magnetics as possible, you can trust Triad Magnetics for all of your medical equipment needs. To learn more about Triad Magnetics’ medical grade power supplies, inductors, and transformers, contact us today.